This morning at the Folk School the blacksmiths pounded steel and the woodcarvers gouged bowls. The cooking class fried stuffed peppers and the rug hookers dyed wool. Where was I? Lying on my back staring at the clouds – doing “cloud therapy” as my writing instructor called it. It was while watching wispy clouds flow towards each other that I thought back to the the last time I did this. I was a child – and it wasn’t called therapy. It was just something we did because it was fun. In fact, there are a lot of things we did as kids that, as adults, now have the word “therapy” after them: music therapy, art therapy, physical therapy – even play therapy! How interesting that when we’re ill, our healing involves going back to those things that we did as kids. Here’s the good news: you can get all that therapy in one place. 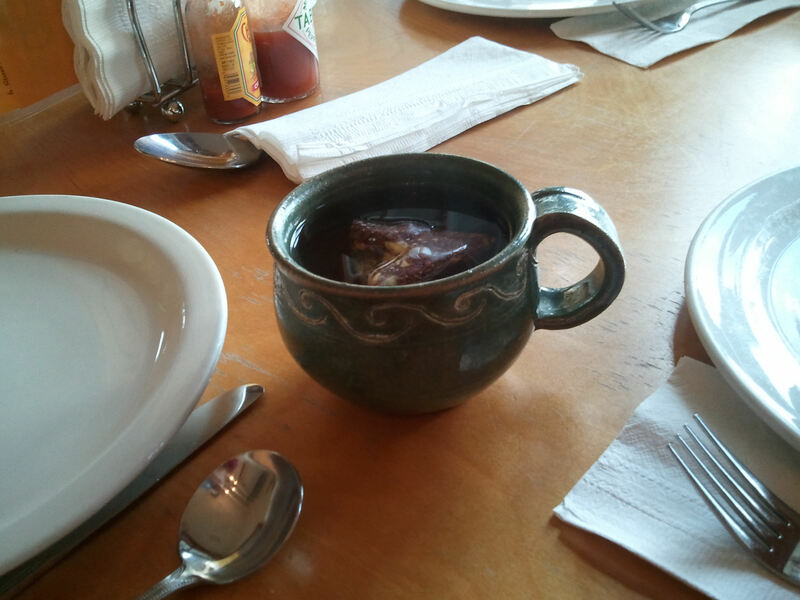 Right here at the John C. Campbell Folk School. You can hear music every morning at 7:45, every Tuesday night at the dance, every Friday night at the concert. You can get some physical activity by doing Morning Walk every morning at 7:15 (with yours truly), or by participating in the aforementioned weekly dance. You can take classes in all sorts of arts and play for hours in your chosen medium. Therapy, after all, isn’t just for the sick. I enjoy reading Nina Yau’s blog. She’s a writer, a traveler and lives very simply. Everything she owns fits in a backpack. “Oh – look at your pretty toes!” she said. I smiled as I looked down at my Merlot-colored toenails. They hadn’t been out in public in quite some time. No, it wasn’t the beginning of summer. This was last week. Weather-wise, we are still in open-toed shoe season, but here at the Folk School I’ve taken classes that require me to do something I haven’t done since I was twelve: wear sneakers for a week straight. I’m not the sneaker-wearing type. There was a two year period in college when I didn’t even own sneakers. In general, I’m not a casual dresser either. Yes, I wear jeans. But usually with a cute top, earrings, and nice shoes – heeled boots in winter, platform sandals in summer. I don’t have a floor-to-ceiling closet full of shoes like my youngest sister Meg, but I’ve got my fair share. Unfortunately, most of them haven’t been worn for quite some time. Why? Because I’ve chosen classes over the last few weeks that have an unwritten dress code. In woodturning, there are plenty of sharp objects that can go flying – or falling. So close-toed shoes are a must. So are high-collared shirts for women. No one mentioned this to me, but I was smart enough not to wear my usual V-necks to class. What I thought was a high neck-line didn’t cut it, though. Thankfully, the resident woodturner is a woman. She understood and had a T-shirt on hand that I adopted as my smock for the week. Prior to that, I had woodchips in places that I don’t care to get into here. Also no-no’s in woodturning: hair worn down or in a pony tail. Getting your hair caught in a lathe spinning at 1200 RPM’s – not good. Getting anything caught in a lathe spinning that fast wouldn’t be good – so jewelry is also out of the question. 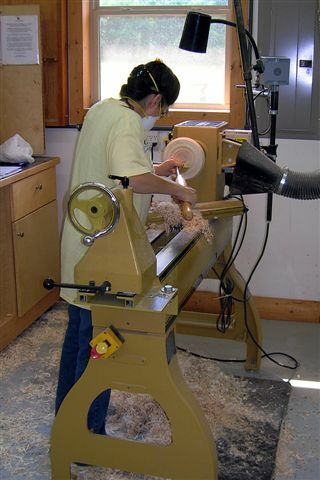 Me on the lathe in woodturning. After my adventures in woodturning, I took a cooking class. You would think you could wear whatever you want while cooking, but not in a place that has liability to worry about. Knives can fall and slice toes, so once again my open-toed shoes were relegated to the back of my closet. 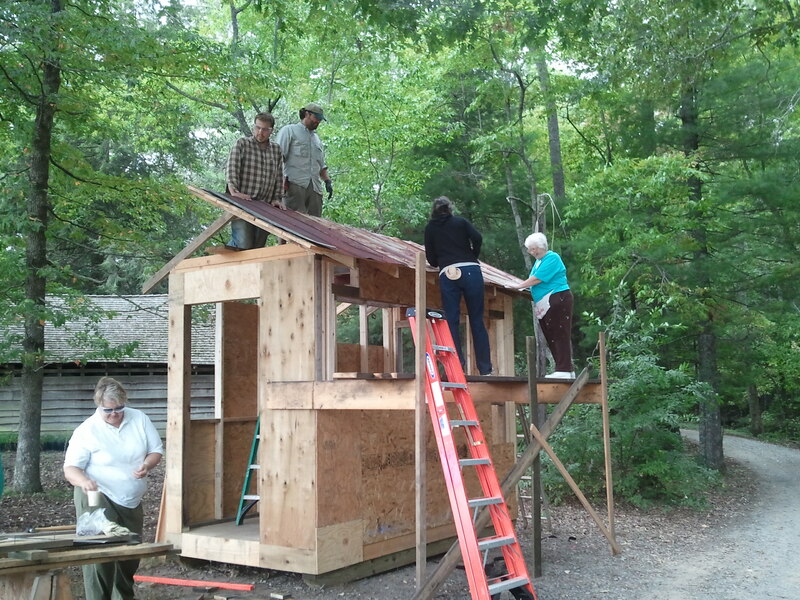 Last week, I was building a garden shed. Well, trying to learn at least. You don’t see open-toed shoes on a construction site. 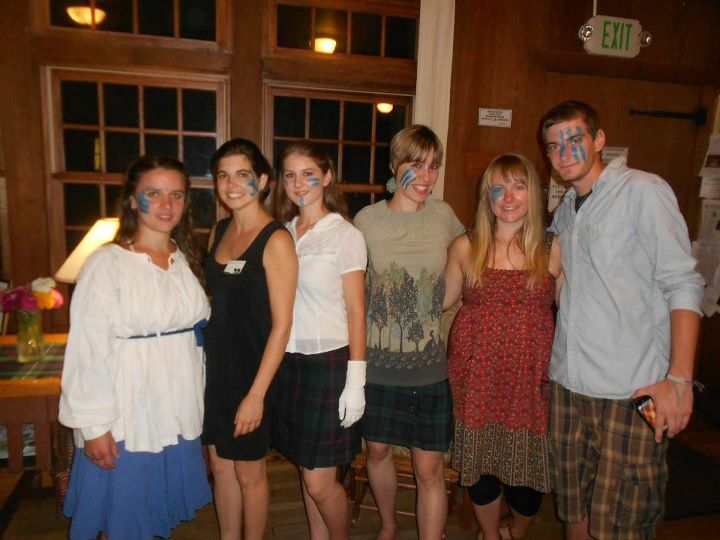 Thankfully, there is at least one night per week that open-toed shoes, earrings, and even dresses are seen on campus. Every Tuesday night, there is a Contra and Square Dance in the Community Room. Locals join students for this weekly event that even has live music. No experience necessary, and no partner is needed. In fact, this is the only place I’ve been where I’ve actually witnessed a shortage of women at a dance. So on Tuesday nights, the dresses I used to wear so often in my previous life finally get to see the light of day. I reach into the depths of my closet, pull out my open-toed shoes, slip my feet in and smile at my painted toe nails. One of the things that makes life so interesting is that we don’t all have the same gifts. It’s why we need other people. I, for example, have no gift for fixing my car. My uncle, however, was blessed with this gift. This is great when he and I live in the same state, but when my car dies in North Carolina and he’s in New York, well, at least I can call him to vent (I also have a gift for communication). This is not to say that we are not meant to try new things. In fact, trying new things is one way to discover new gifts you didn’t know you had. But then there are those of us who – really, truly, deep-down – know there are certain gifts we have not been given nor are we ever meant to have. Making things out of wood is one of those things for me. Don’t get me wrong – I’ve had fun trying (and plenty of ups and downs) as these pictures show. So thank you to my kind and patient instructors who never doubted for a moment that I couldn’t learn their craft. I could. But thankfully God gave me other gifts, so I don’t have to. 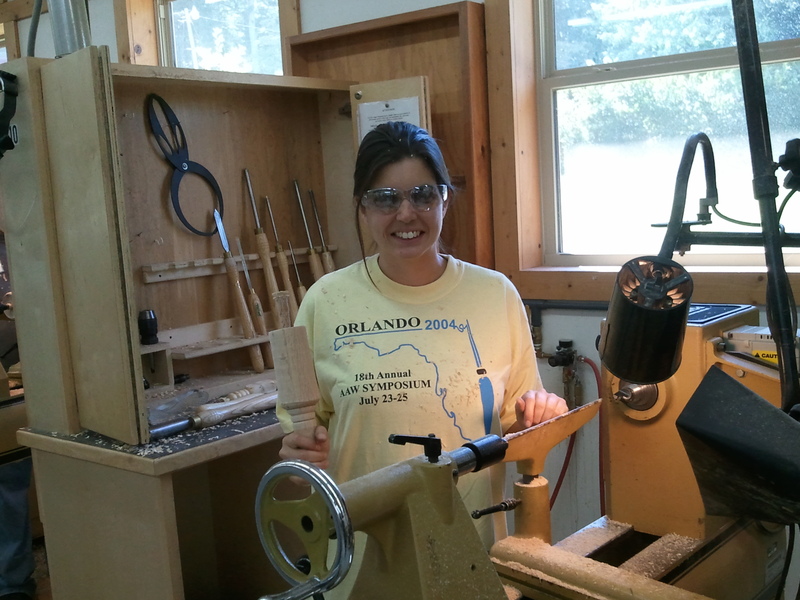 On my first evening in the woodturning studio two weeks ago, I put on the safety glasses the Folk School had on hand. I could feel the plastic digging into my cheeks. Wearing these things for six hours a day for the next five days was not going to be comfortable – and the indented-skin-around-the-eyes look just wasn’t doing it for me. So I decided to head to Lowe’s the next morning to get myself my own pair of safety glasses. I’m not your typical Lowe’s customer. First of all, I’m female. Secondly, my typical attire includes heels and jewelry and makeup. But this can all be used to my advantage to get in and out of these places as quickly as possible. So on Monday morning, I did what I usually do when I have to step into a home improvement store: I dressed cute, put on a smile, walked in the door and asked the first person I saw where I could find what I wanted. I was in and out in five minutes. 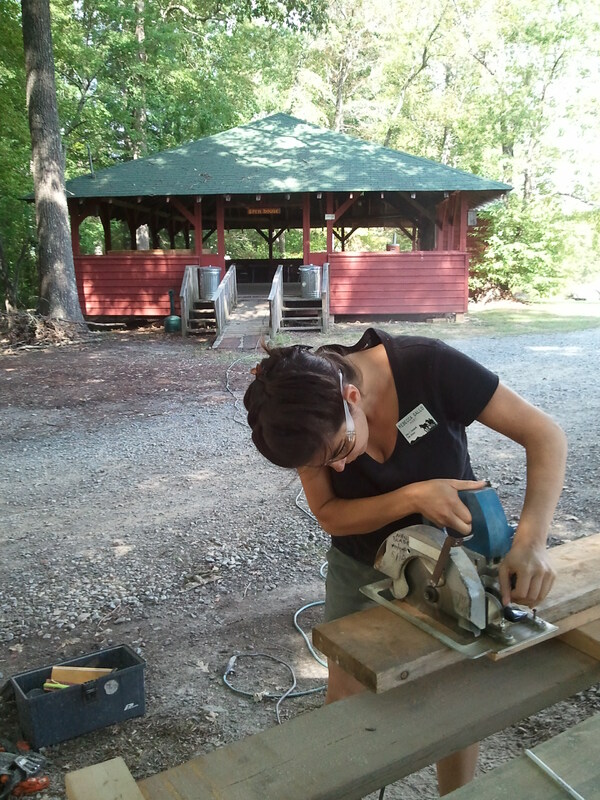 Me at my lathe in my fancy new safety glasses. Two weeks later, I found out I’d be heading to Lowe’s again. Twice in two weeks? Who have I become? This time, however, it was a little different. I had missed the first half-hour of class Sunday night as I was doing my host duties. When I arrived, our instructor Tom filled me in: the class had requested we take a field trip to Lowe’s on Monday. This being a course on Building a Garden Shed, the request was not unreasonable. 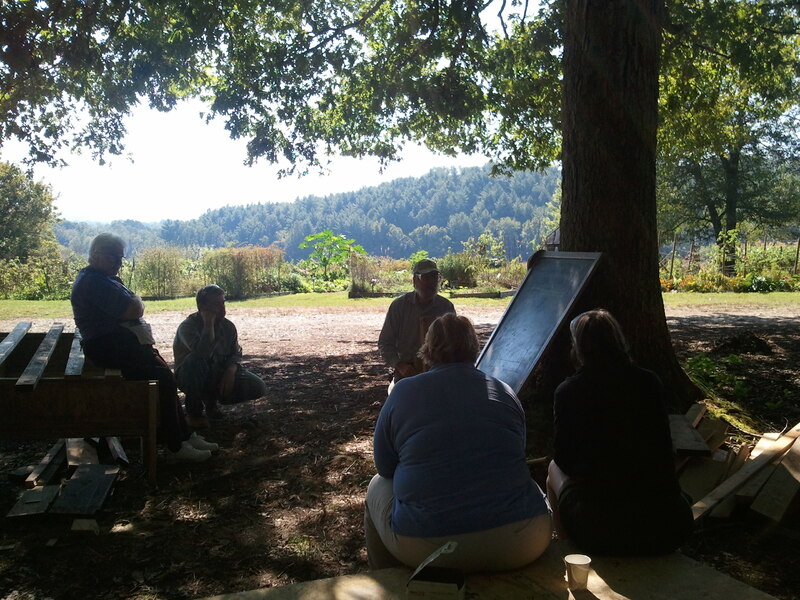 “Before you go, you should know what you want,” Tom explained to us in our outdoor classroom Monday morning. “Just like when you go grocery shopping.” So I listened as Tom asked us to dredge up our fourth-grade math skills to figure out how much wood we would need. Our outdoor classroom. Tom, our instructor, is at the chalkboard. 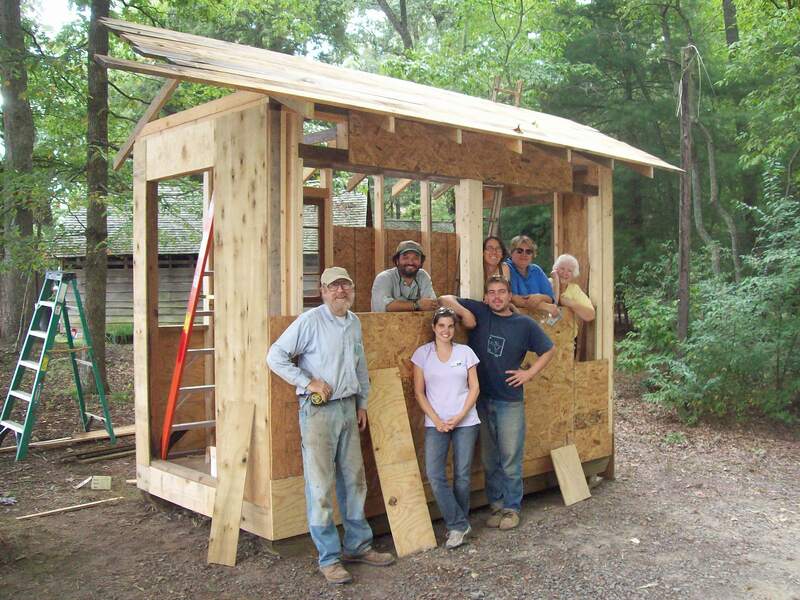 Our class would be using wood salvaged from the Folk School’s maintenance department to build a garden shed for the school, but my classmates would have to buy their own wood if they wanted to do this at home – which half of them did. So after our lesson on building materials, I got behind the wheel of the Folk School Suburban and drove us all to Lowe’s. I walked into that store looking almost like someone who belonged there (i.e. dressed in jeans and sneakers as opposed to heels and a skirt). Tom led us into an aisle I never would have dared enter prior to this class: the one full of wood. 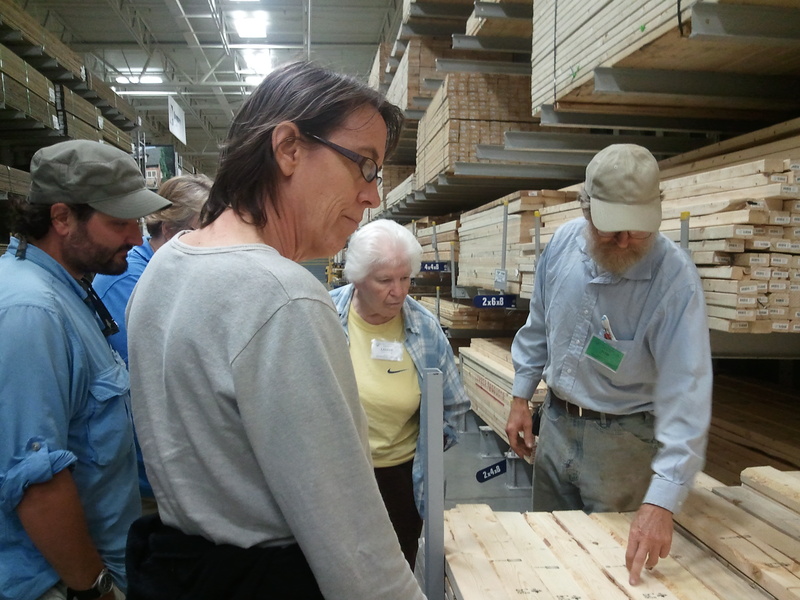 Tom patiently answered everyone’s questions about two-by-fours, plywood, and roofing materials. 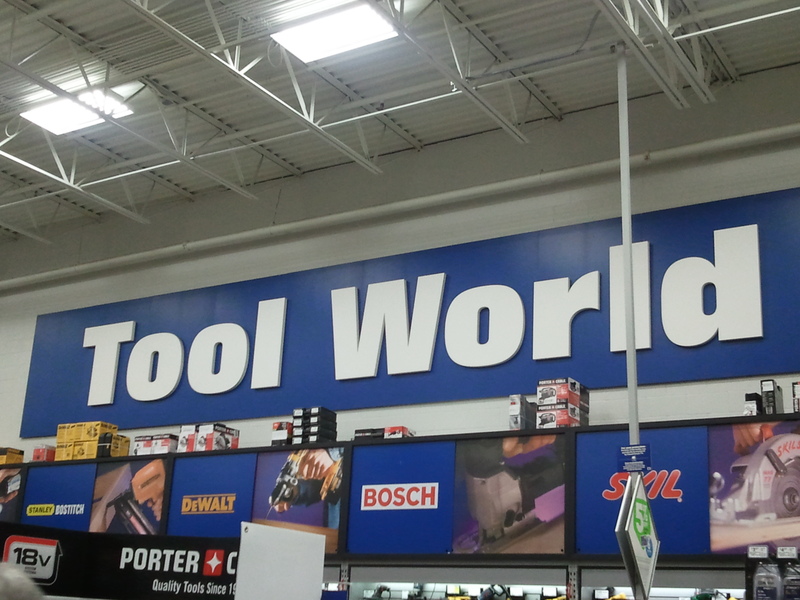 “If we have enough time,” Tom said earlier that morning, “we can head over to Tool World.” I thought it funny of him to call the tool section Tool World. Not til we got there did I realize Lowe’s actually has those very words written on the wall. 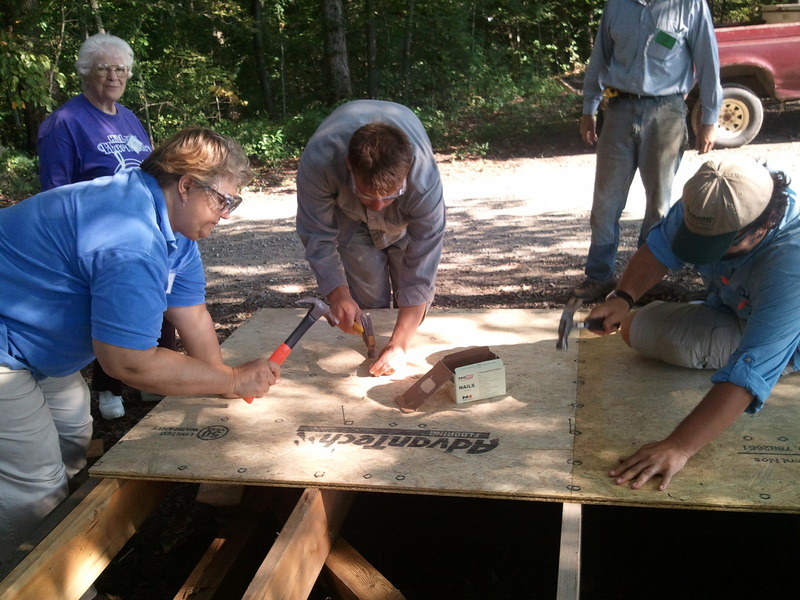 Tom showed us the tools that were worth the investment and those that were truly unnecessary. There really is a Tool World. I walked out knowing a lot more than when I walked in, but thinking my life would not be missing anything if I never had to step into Lowe’s again. It was a full page ad. The woman wore funky glasses and an angled, blunt haircut. Her posture, her smile, the sparkle in her eyes emanated a happiness, a confidence, and a freedom I wanted. But none of that is what drew me in. As I flipped through the catalog for the Boston Center for Adult Education that day, what caught my eye was the title of this woman’s course: Making a Living Without A Job. Well, who wouldn’t want to know how to do that? The course had the same title as her book. A book? You mean there was a whole book on how to make a living without being tied to a soul-sucking 9-5 job? As it turns out, there are quite a few shelves of books on this very topic. On my trip to the bookstore, however, I was on a mission. I picked up Barbara Winter‘s first and, as I do with all books before I buy them, I opened to the first page and started reading. I couldn’t stop. I bought the book, signed up for her course, and wouldn’t be living the life I live today had I not seen that ad over ten years ago. If you dread Monday mornings, don’t have time to do the things you love most, are forced to commute the same time everyone else does, or have to commute at all, I highly recommend checking out Barbara’s Joyfully Jobless web site and book. As far as I can tell, we only get one life. Might was well make it one you enjoy living.